I was at the bookstore browsing books about child education and I came across this book, 陪兒子說說話 — 爸爸一定要告訴兒子的44件事. It was an interesting title because I was wondering what are the forty four things that a Dad would want to tell his son. I browsed through the first couple chapter and I decided to take this book home. This book has forty four letters with topics of friendship, relationship, and life lessons. I believed most of us are familiar with these lessons. I think as we are living by these standard, I need to remind myself that the children might not know about these so call standard in today’s world. I bought this book home not only because I want to read the stories, I also want to have this book in my bookshelf to remind me about these lessons I need to tell to my children as they grow up. This book does not try to make you cry, but it brings you joy reliving the moment that you had and looking forward the moment you will have with your young ones. This entry was posted in Book on May 25, 2015 by Kennith. I was intrigued by a co-worker was talking about how he heard a story on NPR that some wall street firm dig a tunnel from Chicago to New York in order to gain advantage over the speed of the network to gain priority over others to increase their earning in the stock market. I made a search on npr.org and found out about this book. I was immediately hooked on reading this book. It’s fascinating how one small group of people who are already making millions decided to drop what they are doing and start a company to do good for the market. This book chronicles the history of this group and the reason of what they are doing. This book explains a lot about technology and wall street. You do not have to understand both to follow the story. 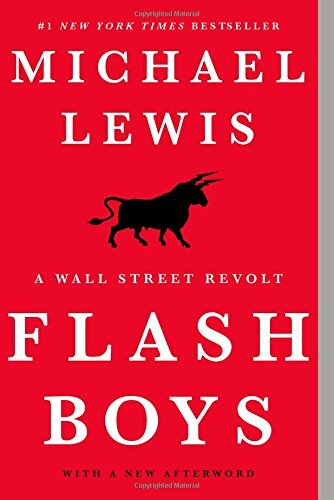 After reading this book, I gain tremendous knowledge about wall street and another view point from the technology. I like how in one chapter explaining the relationship between business and IT department in the company. In a non-technology business world, the business people sees IT as a tool. They throw a lot of requirements and features to the IT department to develop without explaining anything to the IT department about how the business works. (Maybe the business people do not even know how the business work.) When something does not work out, the business people often blame the software that the IT department developed did not work. I think that business operation needs to understand that today’s business needs IT and while IT needs business to generate revenue to run its software. Both sides needs to respect each other and have a good communication between them. I highly recommend this book. If you are already buying stock, you might be really angry or happy over your stock firm. If you are a technology person, you will be fascinate about how technology plays a role in the business now a days. This entry was posted in Book on May 17, 2015 by Kennith. I am not a good note taker. I usually write down the things I think is important during my days in school. I did not have a note taking system, it was mostly a bullet point format. It is the reason my attention was attracted to this book’s title. This book introduced a different way of taking notes. It first started by advising readers to use squared formatted note book instead of traditional single line note book. It introduced breaking down the note’s page into three sections, title, content, and action. It gives some suggestion on how to take notes with these three sections and some suggestions on how to review them after taking notes. This book also gave me some idea on what kind of stationary to use when taking note. As the type of reference book, it provided many examples to give me some ideas to follow. If you have no idea how do you supposed to take notes or if you want to improve on your skills to take notes, this will be a good book to read. The technique applies to English too, it does not restrict to Asian language. However, I do not know if this book has an English translation available. This entry was posted in Book on May 10, 2015 by Kennith.